Abbey McCree finds herself in Snowberry Creek after inheriting herAunt's home after her divorce. With happy memories from her youth and a fresh start find her stepping into a few roles her aunt had filled in the town, president of the ladies quilting guild and head of the senior citizens committee. But when the body of her aunt's long time frienemy is found in the backyard wrapped in one her aunt's handmade quilts, Abbey finds that some people think her aunt killed the woman. Since dead people tell no lies, or fact for that matter, Abbey decides that she not only needs to clear her aunt's good name, but find justice for the murdered woman. With quite a few suspects but no real motives, everything seems to be linked to the quilts that the quilting guild ladies made. Soon Abbey receives a chilling warning from the murderer and agrees it is time for her to keep her hose out of the investigation, but it may be too late to back off and be safe. Luckily she's got a loyal and faithful dog and the support of her handsome tenant, Tripp, as well as that of the local sheriff, Gage. As with any new series, it took me a few chapters to get fully immersed into the new characters but I found myself unable to put it down once I get into the story. So many potentials suspects, but it took awhile for things to full click into place. The characters and writing are solid and I enjoyed the first book in the new series. Death by Committee is a cute cozy mystery. I thought it was a quick and easy to read book. Abby McCree is newly divorced from a cheating husband and out of job since he bought out her share of the company. Moving to Snowberry Cree gives Abby a new start. She has inherited a large Victorian home along with the contents plus the oversized Zeke and a handsome tenant in the mother-in-law cottage. Abby is an appealing character who is helpful and friendly with the elderly ladies of the quilting guild. Louise Allen, Jean Benson and Glenda Unger are the three quilting guild members who rope Abby into various projects and enjoy watching Tripp work in the yard (frequently without his shirt on). Tripp Blackston is ex-military and a college freshman who is renting the mother-in-law cottage. There are frequent mentions of Tripp’s physique as the ladies ogle him. The author is setting him up to be Abby’s love interest, but I do not admire his bossy attitude and hair trigger temper. The mystery is straightforward with a small suspect list, a red herring and pointed clues. Abby talks with several people to gather information, but that is the extent of her investigating. Solving this whodunit is a piece of cake. I did like how the mystery was wrapped up at the end. I like Gage Logan, the chief of police. He is friendly, helpful and has a sense of humor. 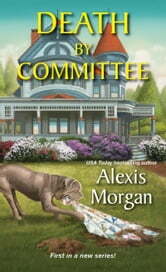 Death by Committee is a good start to An Abby McCree Mystery series. I hope the author takes the time to develop her characters in the next book and provide more details on the town. 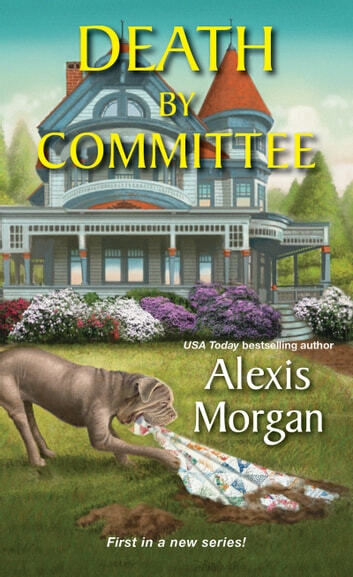 Death by Committee is a light hearted cozy mystery with a charming Victorian home, a cute mastiff mix, beautifully crafted quilts, three busy older ladies and killer on the loose. Great new series! Abby McCree is a believable main character and sounds like a person you would want to be friends with. Tripp is the perfect foil to Abby and Police Chief Gage is interesting as well. The setting is a nice small town with a great group of supporting characters. Looking forward to reading more with this series.